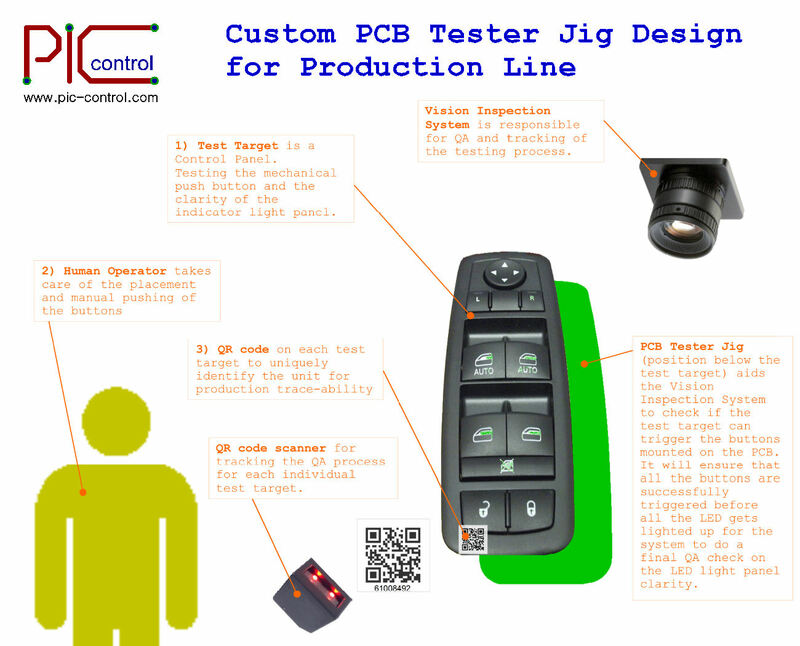 PIC-CONTROL can help you design an In-Circuit Test Station (ICT Station) or tester jig fixtures PCB circuit board for your factory’s production line QA (quality control) testing. A well designed and integrated electronic testing station can significantly improve the production speed, and reduces quality defects due to human error. The designed tester can also be integrated into your existing system as a complete QA tracking system. Contact PIC-CONTROL for your electronic tester jig board fixture requirement today. An operator picks up a new target for QA testing. Operator scan the QR code (serial number) on the target to inform the inspection system for QA tracking. Operator place the target on top over the PCB Tester Jig. The inspection system triggers to reset the PCB Tester Jig. The PCB Tester Jig blinks 3 times to indicate the start of the test procedure, after which all lights will be off. The operator will then proceed to press all the buttons in any preferred sequence. LED will be lighted up progressively corresponding to the button pressed. When all the buttons are pressed, all the LED should be lighted up. 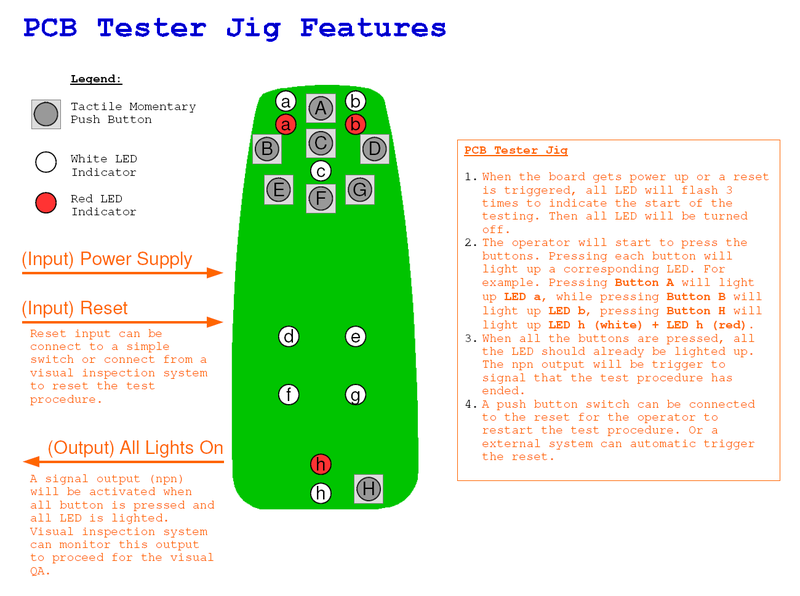 The PCB Tester Jig will output a signal to indicate that all the buttons are pressed. The inspection system will hold on for a second for the operator’s hand to be cleared before taking its visual inspection for the LED panel’s clarity. If everything is OK, the system can accept the test and prompt the user to proceed inspection for the next new target. If the inspection system rejects the QA check, it could be due to 4 possibility. The target panel did not meet the quality required. The operator forgot to press one or more buttons on the target panel. One or more mechanical button is faulty. The PCB Tester Jig is faulty. Spring Test Probe Pogo Pin (for making contact with the test pads on your target PCB board). Ribbon connector for test cable. Preprogrammed microcontroller to test the target board. Indicator to display to the operator the test result. Computer system to display detailed test result (optional). Contact PIC-CONTROL today for an In-Circuit Test Station (ICT Station) or PCB test fixture jig design to improve your production line efficiency. Also check out our custom cable tester design for your wire harness assembly checking and the custom test switch box.